If you’re looking for a competitive offer on home demolitions, you need look no further than the State of Israel. They’ll send out their Army in state of the art armoured bulldozers, with a committed workforce dedicated to working those unsociable hours. Early day or the dead of the night, and often with little or no notice, the only thing these boys will let down is the roof. And further yet, they charge a fee so small that these prices will quite literally bring the house down. We are all stooges for a good offer, but that’s not quite what my inner cynic is getting at here. There is a housing crisis in the Holy Land, and while we may be quick to turn our heads to the boulevards of the make shift tent-towns in Tel Aviv, it is a ‘housing crisis’, euphemistically called, that has been occurring for over 40 years. State sanctioned demolitions of Palestinians’ homes have been carried out under the auspices of military necessity, administrative shortcomings, or punitive reprisals. There is no secret that they are authorized by the government and facilitated by the Israeli courts; rather, the contention lies in their motive. Based on figures the Israeli Committee against House Demolitions has accrued, approximately 24,813 Palestinian structures have been destroyed since the 1967 Six Day War. Such a graph, were it plotted, would look like the crudely drawn plans of a rollercoaster, weaving and bobbing, twisting and turning, and notably reaching its climax during times of heightened conflict: keep this particular point in mind. The home is perhaps one of the few places one can escape the occupation. Indeed, while its pervasiveness intrudes into most areas of a Palestinian’s life, the home is a semi-permeable barrier. It is the ephemeral sanctuary, the walls which deflect the piercing rays of the occupation. We eat, we pray, we entertain, we laugh, we do things which no other place can sufficiently accommodate. Our homes are our bases that we build our lives around, and for the Palestinian, it is their refuge. So when the Israeli Army arrives with little warning to make your home blend in with the surrounding rubble, you reach your weakest and most vulnerable state; you have nothing to create a livelihood from. The Israeli government and military clearly have some very intelligent men and women working in their midst. Their task becomes a paradoxical skill of creative manipulation of the legal science in ordaining such conduct. The legal arguments are a master class in sleight-of-hand and clever word play, a syncretism of accentuating certain laws and dismissing others. In 2004, Adalah, an advocacy centre that brings petitions to the Israeli Supreme Court on behalf of the Palestinian Citizens of Israel, filed a petition to the court to contest the Israeli Army’s exploitation of the ‘Absolute Military Necessity’ doctrine to demolish homes. 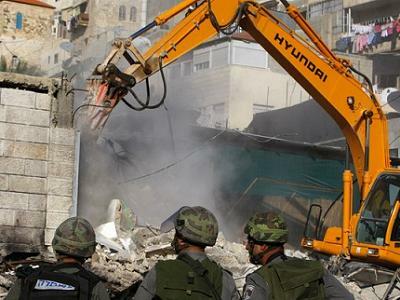 Article 53 of the Fourth Geneva Convention allows for limited derogation of the occupier to demolish homes under the conditions of absolute military necessity. It is quite clear that occupation does not equate to such circumstances; however, the combination of systematic acts of violence that gains a military advantage (as well as the general requisites of adequacy and proportionality), may invoke the narrow remit of military necessity. However, determination of these circumstantial facts is at the behest of Israeli military commanders. The more discerning can see why this would throw the notion of objectivity into disrepute. The petitioners at Adalah also highlighted how destruction of civilian property clearly offended the obligations of the occupier under humanitarian law. As well as the Fourth Geneva Convention, which lays out the duties of a belligerent occupier, conduct is also supervised by The Hague Regulations. In addition, the other legal source, a relic of the British Mandate’s colonialist jurisprudence and something that worryingly has clotted itself within the Israeli legal system, are Defence (Emergency) Regulations; specifically, Regulation 119. This provision allows a military commander the power to seize and destroy property of an individual he suspects is either carrying a firearm or explosive, or has commissioned a criminal act. – Historically, these were the laws used to repress indigenous resistance to colonial powers but worryingly, a government sponsored bill aims to etch these into permanent legislation. Under the obligations of the Fourth Geneva Convention, preference is given to domestic law, adhering to the principles of legal self-determination; what lawyers refer to as the Local Law Doctrine. Israeli lawyers will thus justify demolitions under the provisions of municipal law, Regulation 119. However, this only functions if municipal laws don’t hinder the provisions of the international convention; which Defence (Emergency) Regulations do by allowing demolitions outside the remit of absolute military necessity. The government’s saving grace is its rejection of the Fourth Geneva Convention and subsequent canonization of Regulation 119. Additionally, Israel argues the applicability of the Convention as Palestine is not a state party. Although differing in nomenclature, there is a consensus that Israel justifies demolitions under three guises. The first is administrative demolitions, in which homes are destroyed because of failures to obtain the relevant permits or some other form of technical misdemeanor amendable under administrative law. Secondly, there are military demolitions, which fall under the remit of the rules of military necessity during times of war. Finally, there are punitive demolitions, which are reprisals against real or perceived criminal or terrorist activities. Demolition orders are issued through the following channels: administrative demolition orders are dispensed by the Interior Ministry (or, in Jerusalem, there is an overlap between the Interior Ministry and Jerusalem Municipality) with no due process and are thus entirely political decisions. Judicial Demolition orders address similar administrative shortcomings, but under the strictures of criminal procedure. However, even due process and judicial independence are not robust enough safeguards against these practices. As an administrative measure: there is a policy that runs under this that renders any administrative justice for Palestinians obsolete. This manifests as a concerted effort to maintain Jewish demographic supremacy, particularly in Jerusalem and, with settlement construction, in the West bank. Land which is owned by Palestinians will have no approved town plans by the Israeli authorities, and bureaucracy will mitigate the chances of approval for Palestinian structures. This asymmetry finds its way to the courts; Jewish organizations can successfully lay ownership claims related to rights in the pre-1948 area of Sheikh Jarrah, just north of the Old City of Jerusalem. Similar claims for Palestinians are not admitted to court. No legal redress and almost impossible means of obtaining permits leaves Palestinians extremely vulnerable. Building “illegally”, therefore, is the only option. Interestingly, while building “violations” in East Jerusalem dropped by 70% in recent years, demolitions skyrocketed. As a military measure: as a military tactic in classical antiquity, home demolitions have been used to both raze cities and to upset the demographic complexion of certain areas. Occupation does not give free reign to demolish homes, and this is expounded by the provisions and spirit of the Hague Regulations and Fourth Geneva Convention, which distinguish between this and jus in bello. However, without an independent arbiter to determine the transition from occupation to military necessity, this becomes a carte blanche for home demolitions. The jurists and executive find little, if any requirement, in explicating themselves in these terms instead standing solidly to the Defence (Emergency) Regulations. These have come under intense scrutiny and criticism for their discriminate application and arbitrary use toward Palestinians. Demolitions in this context presuppose that a military advantage is gained from such conduct, ignoring the crippling impact of the occupation. There is simply no question of any equality in combat, and this is made clear in the distinction between occupation and military necessity. As a punitive measure: if the person accused has a fair trial and is convicted, as a form of retribution, home demotions still offend the general principles of proportionality. However, demolitions rarely do go through due process, again in contravention of International Humanitarian Law. In a rather callous attempt to circumvent the obligations of a fair trial, the Israeli Supreme Court in Nazal v. Commander of Judea and Samara Region referred to home demolitions as a ‘deterrent’ rather than a punishment. In 2005, an Israeli Army Committee found no link between home demolitions and deterrence and the policy was halted (save for an extreme change in circumstances). In effect, to use the words of the Israeli Human Rights Organization B’Tselem in their report on home demolitions, it was punishing the innocent as official policy, using them as mere means. During the second Intifada, however, there was an exponential increase in ‘home demolitions as deterrent’, but the evidence from the uprising illustrated that it did little to quash the dissent. Indeed, recently, during a time of relative ‘calm’, home demolitions sharply increased, with 700 people being displaced in the first six months of 2011 compared to 594 for the entirety of last year. Tanzil-Zaman Chowdhury is an activist and research student at the School of Law, University of Manchester. His research involves looking at the principle of Equality in Israeli jurisprudence, the privilege of ideology in Israel and how this impacts on the Palestinian minority.